Sherlock and Watson, we presume, are about 7 months old with, as you can see, unique and complimentary coloring. Sherlock has black with white markings (and a carefully groomed mustache); Watson has white with black markings (and a white tipped tail). These brothers make a great pair and would love to be adopted together. Sherlock is a little shy but will come around. Watson is the more outgoing of the two. They both are playful and full of typical youthful curiosity. And they love all things toys. Plus, they are good with children and dogs. Both are neutered and up-to-date on vaccines. 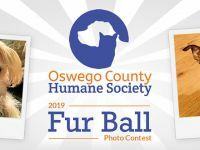 You can meet more cats for adoption at the Oswego County Humane Society Cats & Snacks on Sunday, October 28 from 11 to 1 and 2 to 4. Cats to play with, free refreshments, admission fee is a donation of cat or dog food to our Pet Food Pantry.